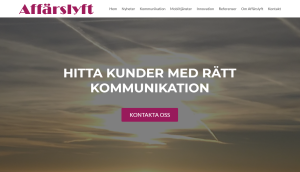 Affärslyft advises companies how to communicate better with their markets and customers. Abiro and Affärslyft collaborates regarding promoting CliqTags. Abiro designed and built Affärslyft’s new site. The companies started collaborating during 2014, and still do. The site was redesigned during January 2018.